Alphin Apartment in Mossley, Lancashire sleeps 4 people. Alphin Apartment in Mossley is a beautiful first floor apartment whoch can be found on the edge of Saddleworth Moor. 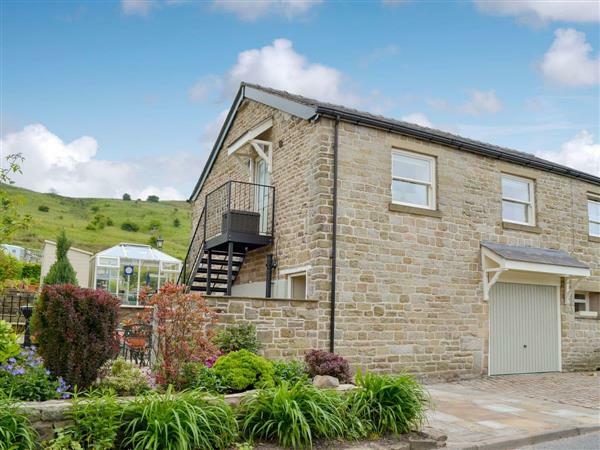 Set above the friendly owner’s garage, it offers beautiful far reaching views across the South Pennines. Just 2 miles from the popular village of Uppermill, a village which is fast becoming a rival to the trendiest parts of south Manchester, but in a semi-rural environment. Uppermill is popular with walkers, cyclists and nature lovers alike with the immediate area surrounded by beautiful countryside such as the spectacular Dovestone Reservoir which is just 10 minutes away, and backs onto the Peak District National Park and all it has to offer. The Diggle end of the Standedge Tunnel is nearby and Uppermill together with a bustling high street full of restaurants, bars and swish cafés also offers canal boats tours and both canal and riverside walks. Just 5 minutes in the other direction is the small town of Mossley, and uniquely is where the historic counties of Lancashire, Cheshire and the West Riding of Yorkshire all meet. Around an hours scenic car journey across the moors will take you to the tourist hotspots of artsy Hebden Bridge and fabulous Haworth with its cobbled high street, most famous for its Bronte heritage. Holmfirth most recognisable from Last of the Summer Wine, and the bright lights of Manchester can be reached in around 30 minutes or the city of Leeds in around an hour. Two good food serving pubs are within easy walking distance, and other local attractions include the annual ‘Yanks’ weekend held each August (Dobcross was used as a filming location for the blockbuster ‘Yanks’ starring Richard Gere) and the ‘Whit Friday Brass Band Contest’, often described as ’the greatest free show on Earth’. The shop is 4¾ miles from Alphin Apartment in Mossley, with the pub and restaurant ¼ mile from Alphin Apartment. Living room: With Sky TV (sports package) and DVD player. Kitchen: With electric oven, induction hob, microwave, fridge/freezer, dishwasher and washer/dryer. Shower room: With shower cubicle, toilet and heated rail. Holidays at Alphin Apartment run from Friday to Friday. Pets allowed at Alphin Apartment. For a better idea of where Alphin Apartment is, you can see Alphin Apartment on the map below. Alphin Apartment is in Lancashire; should you be on the lookout for a special offer, you can find all the special offers in Lancashire. It's always worth checking to see what is on offer at the moment. Do you want to holiday near Alphin Apartment (UKC3332), you can see other cottages within 25 miles of Alphin Apartment; have a look to find your perfect holiday location.